Recently my wife and I were in a lounge area, waiting to be seated. On the wall, as is the current custom, was a large, loud television. The noise made conversation difficult, so our attention wandered to the screen, where we could see “Live with Kelly and Michael” — a show in which celebrities promote their latest projects. While it’s not necessary for a person to remember every single bit of factual information he or she comes across in life — especially if that person can remember where and how to find that information in the future — celebrating one’s intellectual laziness and lack of curiosity is not going to be a successful life strategy for the vast majority of us. I try to emphasize this to my students in how I teach. I want students to 1) independently identify what they don’t know but should, and 2) figure out how to acquire that knowledge. This means students have to take responsibility for their learning; my role is simply to create opportunities that they, if they choose to, can exploit. I might need to do a little coaching to communicate the tangible benefits that will arise as a result, but if a particular person does not want to learn, that’s really not my problem. Horse plus water does not necessarily equal drink. This philosophy (which I admit developed over a number of years in the profession) probably explains my current interest in project-based learning (PBL). Since training in the PBL pedagogy wasn’t part of my doctoral program, I’m learning on the job (thereby modeling for students what I’ve described above). 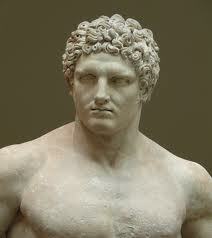 I’ve been seeking out resources that can help me help students collaborate effectively. Collaboration in the classroom often falls apart because students don’t stay on task. As a possible remedy for this problem, I’ve modified a few of the worksheets for collaborative project work in K-12 classrooms. 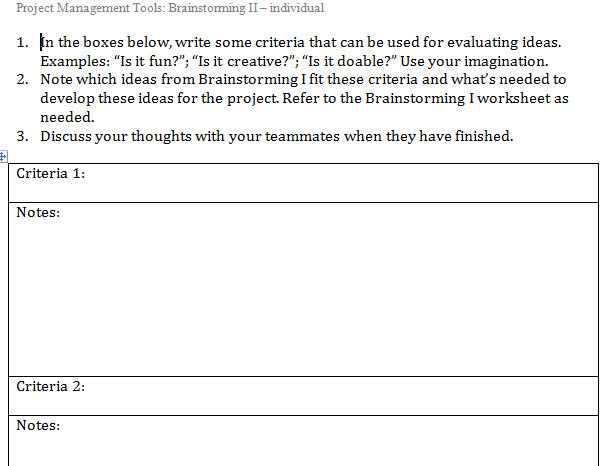 The first worksheets I’m going to use are designed to facilitate brainstorming within a team. 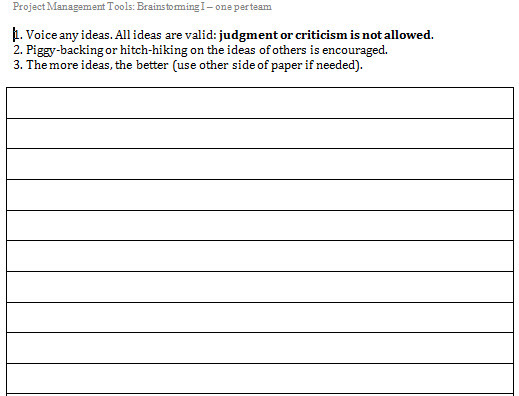 First, the entire team throws out ideas on the team’s project and the ideas are written down on the form below. Team members are prohibited from judging the quality of the ideas during this activity. In the second stage, each member of the team completes a worksheet in which they generate criteria for evaluating the ideas that were listed earlier. In the last stage of the process, the team reconvenes and formulates a basic framework for how it will approach the project. I’ll let you know about the other worksheets that I plan on using in future posts. < Previous Sense and sensibility in simulations: should we try to avoid offending people when we play games?